Latest news is that the Royal Enfiled has been updated with ABS on the Royal Enfield Bullet 500 ABS at a launching price of INR 1.87 Lakh. 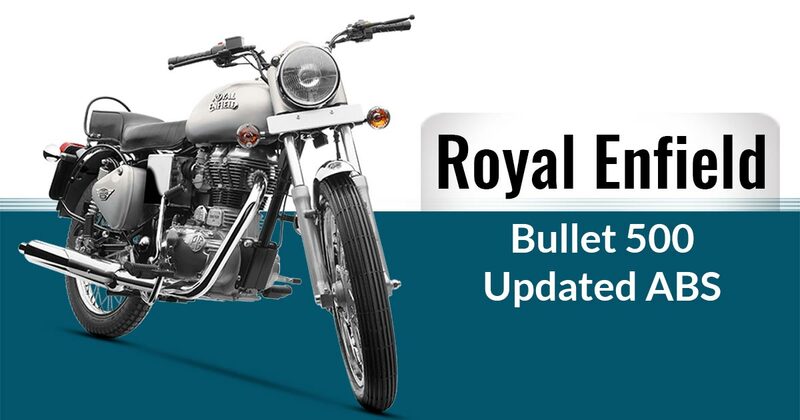 Royal Enfield, which are updating its product range with components mandatory for the new safety regulations, has also updated its Bullet range of motorcycles but with rear disc brake setup. However, the going to be mandatory option ABS is not added to the motorcycle. Earlier it was being offered with front disc and rear drum brake. As of now, there are three models available in Bullet range the Indian lineup. They are the Bullet 350, Bullet 350 ES and the Bullet 500. Ahead of rear disc brake updation, the pricing for the models has been changed to INR 1.28 lakhs, Rs. 1.32 lakhs and Rs. 1.73 lakhs respectively (ex-showroom, Delhi). Beneath the fuel tank, the Bullet 350 and the 350 ES comes loaded with the similar 346cc, single-cylinder powertrain. It is rated to develop the peak power of 20 HP and 28 Nm of torque. While the Bullet 500 uses the peak churn power of 28 HP along with 41.3 Nm via a 499cc engine. The suspension setup on all three of the Bullet variant is same. The telescopic fork up front and twin shock absorbers at the rear. In terms of braking, besides the introduction of the rear disc brake, the motorcycle did not find any changes at all. In the RE’s Indian portfolio, the Bullet range will be the last set of motorcycles to get the ABS to follow the upcoming emission norms. Even the Thunderbird X range has also got updated with the ABS system previous month. Still, there are chances that the Bullet set of motorcycles can get at least a single channel ABS before the implementation of the new safety regulations. Royal Enfield Bullet 350 Trails: What Else One Can Buy in Similar Pricing?